Institute’s Ciaron Harkin was a happy man following their 3-1 win over Donegal Celtic. The talented midfielder fired home Stute’s penalty in stoppage time to make it 2-1 and to cap a fine individual display. 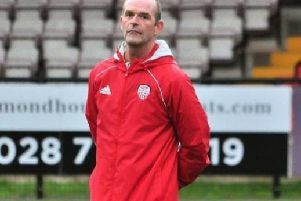 After the game at the Riverside Stadium, Harkin spoke to Kevin McLaughlin.